The bad news: You want to give your home a facelift, but money’s a bit tight. The good news? Home improvement doesn’t have to cost a bundle, especially if you do it yourself! As a matter of fact, a few well-chosen, inexpensive projects can make a big difference. Take a pick from a few of our favorites. And check this out: each project costs less than $100! 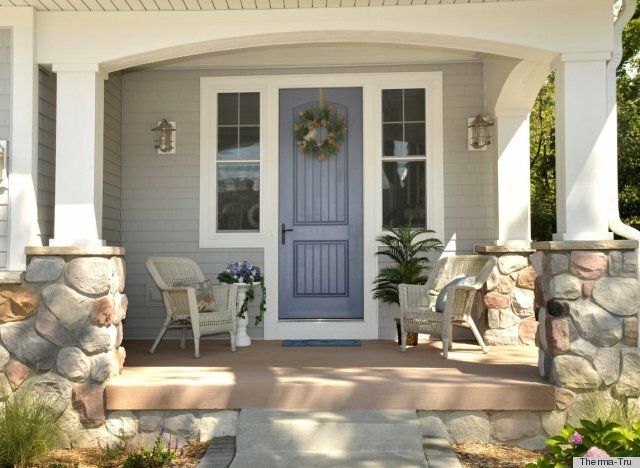 Those of us who don’t live in twenty-room mansions can usually update paint on doors, shutters or trim for less than $100, since exterior paint runs somewhere around $25 a gallon. Small investment, big impact! Just sand off the rough spots and loose paint, fill holes and prime. Paint in a bold semi-gloss color that makes the rest of the house pop! Classy new fixtures will light up your house, in more ways than one! Be sure to consider both style and function, because looking good isn’t enough; you want to be sure you get enough light, too. Save yourself extra time, trouble and money by checking out the existing mounts before you buy. Quickly and cheaply class up your garage by adding Fleur-de-lis hardware. If your garage door is divided into squares, tape the top row off in quarters, prime, then paint the taped-off squares black. Remove the tape, and, voila! Faux windows. Concrete suppliers can provide acid stain in all kinds of colors. The process is fairly simple, the results are unbelievable! Imagine your plain old concrete patio transformed into a work of art, and you’ll get the general idea. Who doesn’t like to toast marshmallows in the backyard? Building this fire pit is as easy as digging a square or round pit and pouring a concrete base. Hold a family rock hunt for colorful, flat stones you can mortar together to build the sides. Since faucets and shower heads account for some 23% of home water usage, updating your water fixtures not only adds style and class, but saves you money. Bottom line, low-flow fixtures can pay for themselves in less than a year! Whether you choose fresh white, soothing mint green or cheery lemonade yellow, updating the color of your cabinets is an inexpensive but sure-fire way to transform your entire kitchen. Switching out cabinet hardware while you’re at gives an extra boost to that brand-new look. With a few strips of baseboard molding, a handful of screws, a dab of caulk and some paint, you can add a touch of elegance to that unadorned mirror. Framing that mirror can change the whole bathroom up and give it a more finished look. Believe it or not, you don’t have to pull up that ugly vinyl floor. You can paint it instead! We’re talking paint made specifically for floors, of course, preferably a latex satin enamel. Decide on a design and/or your colors, then have at it! You’ll have a fresh, new room in no time.